If you're looking for a one-disc compilation for the Talking Heads, one of the greatest groups of the past 30 years... then this is your answer. Best of Talking Heads gathers all of the band's hits , and also includes liner notes by current musicians talking about why the love the songs. Highlights of the record include "This Must Be The Place (Naive Melody)", "Once in a Lifetime", "Psycho Killer", and "Burning Down the House". 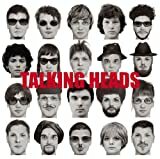 If you're new to the Talking Heads and looking for a good place to start, then buy this CD right away.